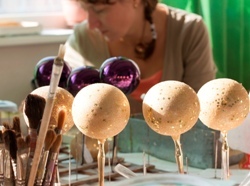 In Slovakia has been engaged in the production of Christmas decorations for the past 50 years the group Okrasa (Embellishment) Čadca. From its inception, the cooperative still prefers handmade work in the production and decoration of ornaments. Production is mainly oriented to export. Ornamental products from Okrasa are known in more than 25 countries around the world, mainly in markets of European Union, but can be found in the United States, Canada, and Australia. The production team has offered more than 10,000 hand-painted designs, which are created from various color combinations and shades with the potential of up to six effects from a single color. In the factory building is an exhibition hall of pattern design, where everyone interested can see the new trends and patterns in the current collections of designers. Between classical centerpieces of Christmas ornaments also belong decorated or matte Christmas balls and pieces of delicate glass flowers, which may constitute as individual interior elements. Among the popular forms of Christmas decorations belong the shapes of fireworks, hearts, glass candles, icicles, or glass spokes all used for the finishing of tree decoration.